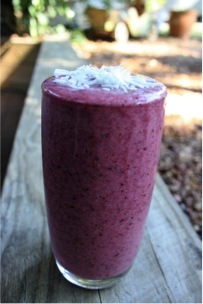 My daughter made herself a morning ‘study break smoothie’ the other day that looked too tasty not to share with all. I stopped her from starting to drink, just so I could take this photo. Hope you like it as much as we do. I also asked her to let me know what she put in it, and this is all you need. Her instructions were pretty simple too. We almost always have on hand in the freezer pineapple in chunks ready to go, and frozen berries. This time of year we happen to have sweet fresh strawberries. The banana is fresh, but you can freeze them also. Using a small serve blender, a handful of each of the fruits was enough and top up with water and blend. Super easy, refreshing and a great boost for your mind and body.